When Jacob was speaking to his people, he told them, “for this intent we keep the law of Moses, it pointing our souls to him; and for this cause it is sanctified unto us for righteousness, even as it was accounted unto Abraham in the wilderness to be obedient unto the commands of God in offering up his son Isaac, which is a similitude of God and his Only Begotten Son” (Jacob 4:5). Jacob’s statement that the near-sacrifice of Isaac was “a similitude” of the Atonement of Christ is a key that unlocks the deeper spiritual meaning behind this story. With this understanding in place, we can go back to the Old Testament with fresh eyes. Looking at the similarities between the Abraham-Isaac narrative and the Atonement of Christ shows how insightful Jacob’s comment really was. If Abraham offering Isaac is symbolic of God offering Christ, then we should expect to find some similarities between God and Abraham. Genesis 17:4–5 suggests just such a similarity: “Neither shall thy name any more be called Abram, but thy name shall be Abraham; for a father of many nations have I made thee.” Through both Isaac and Ishmael, Abraham was certainly the “father of many nations,” just as God is the Father of all nations. In addition, the name Abraham literally means “exalted father” which is a good description of who God the Father is. Another similarity is that God referred to Isaac as Abraham’s “only son” (Genesis 22:2). Similarly, Christ is God the Father’s “only begotten Son” (John 3:16). Isaac was also like Christ in many other ways. Both Isaac and Christ were born to women who should not have been able to have children: Sarah, Isaac’s mother, was too old to have children (Genesis 18:11) and Mary, Jesus’ mother, was a virgin (Luke 1:34). 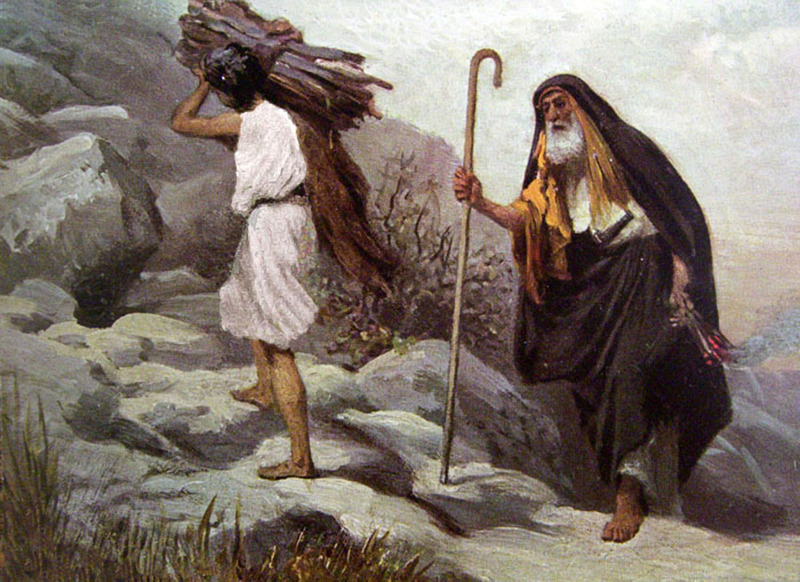 Both Isaac and Christ carried wood with them when they were being offered up: Isaac carried the wood for the burnt offering (Genesis 22:6) and Christ carried the wood of the cross upon which he would become an offering (John 19:17). Both Isaac and Christ were bound before being offered. Abraham bound Isaac before laying him on the wood (Genesis 22:9), and Christ was bound before being delivered to Pilate before he was placed on the wooden cross (Matthew 27:2). Figure 3 Abraham and Isaac by William Hole. Both Isaac and Jesus were gone for three days after being made an offering. Abraham and Isaac would have arrived back home “on the third day” (Genesis 22:4) after Isaac was nearly sacrificed, and Christ rose from the tomb “on the third day” after His ultimate sacrifice (Luke 24:21). Both Christ and Isaac may have even been offered up in the same area (in or around Jerusalem), although it is impossible to know for sure. The place Abraham offered up Isaac was called Moriah (Genesis 22:2), and the temple in Jerusalem was built on a mountain called Moriah (2 Chronicles 3:1). Both Isaac and Christ offered themselves voluntarily. If Isaac was strong enough to carry the wood for a burnt offering on his back, he was likely strong enough to overpower his aged father if he had not wanted to be sacrificed. In the same way, Christ also allowed Himself to be crucified rather than offering any resistance (see Matthew 26:53–54). Finally, in some traditions, both Isaac and Christ were resurrected. Hebrews 11:17, 19 states, “By faith Abraham, when he was tried, offered up Isaac … Accounting that God was able to raise him up, even from the dead; from whence also he received him in a figure.” Although this verse is ambiguous, it can be understood to mean that Abraham actually killed Isaac and that God brought him back to life, a tradition that one sees in some Jewish texts. Thus, Isaac being killed and brought back to life can be seen as a foreshadowing of the resurrection of Christ, or “a figure,” as it says in Hebrews. Figure 4 The crucifixion of Jesus Christ. Image via lds.org. This is the only direct mention of Isaac in the Book of Mormon, outside of the several mentions of “the God of Abraham, Isaac, and Jacob,” the few of mentions of Abraham, Isaac, and Jacob sitting in heaven (Alma 5:24; Alma 7:25; Helaman 3:30), and one mention of the covenant with all three patriarchs (1 Nephi 17:40). Jacob’s explanation of the meaning of the near-sacrifice of Isaac is not found in the Old Testament, but there is a somewhat similar notion expressed in the New Testament. However, the title “only begotten son” in Hebrews 11:17 refers to Isaac (with, perhaps, an oblique reference to Christ): “By faith Abraham, when he was tried, offered up Isaac: and he that had received the promises offered up his only begotten son.” Whereas in Jacob 4:5, the title is used to refer directly to Jesus Christ. According to the ancient Christian writer Caesarius of Arles (ca. 468/70 – 542 A.D.), in his sermon 84.2, Isaac prefigured Christ and Abraham prefigured God the father: “When Abraham offered his son Isaac, he was a type of God the Father, while Isaac prefigured our Lord and Savior.” See Mark Sheridan, Old Testament II: Genesis 12–50, Ancient Christian Commentary on Scripture 2 (Downer’s Grove, IL: InterVarsity Press, 2002), 102. E. A. Speiser, Genesis: Introduction, Translation, and Notes, Anchor Bible 1 (Garden City, NY: Doubleday, 1964), 124. Another possible similarity is demonstrated by the scene when Abraham told his servants that he was going to leave with Isaac and come back with him, even though he knew he was going to sacrifice him. Caesarius of Arles, in sermon 84.4, said that Abraham may have thought, “I am offering my son, and I will return to you with him. So great is my faith that I believe that he who deigned to give him to me of a sterile mother could raise him from the dead.” This would allow him to come back with Isaac, and not technically lie to his servants. Thus, both God the Father and Abraham knew that their sons could be raised from the dead (see Hebrews 11:19). See Sheridan, Old Testament II, 104. Caesarius of Arles, in sermon 84.4, said Abraham could tell his servants that he was going to leave with Isaac and come back with him. Because Abraham thought, “I am offering my son, and I will return to you with him. So great is my faith that I believe that he who deigned to give him to me of a sterile mother could raise him from the dead,” allowing him to come back with Isaac. See Sheridan, Old Testament II, 104. In sermon 84.4 Caesarius of Arles stated, “When Isaac carried the wood for the sacrifice of himself, in this too he prefigured Christ our Lord, who carried his own cross.” See Sheridan, Old Testament II, 104. Melito of Sardis (died around 180 A.D.), fragment five, refers to this. See B. P. Pratten, “Remains of the Second and Third Centuries,” in The Ante-Nicene Fathers: Translations of the Writings of the Fathers down to A.D. 325, ed. Alexander Roberts and James Donaldson, 10 vols. (Grand Rapids, MI: William B. Eerdmans Publishing Company, 1951), 8:759–760. Caesarius of Arles commented on this in Sermon 84:2. See Sheridan, Old Testament II, 103. Another possible similarity is the two other people present in both cases. Abraham’s two servants were present when Abraham took Isaac away to be offered (Genesis 22:3), just as Christ was crucified between two thieves (Mark 15:27). It is interesting to note that the sacrifice that was ultimately offered, the ram, was stuck in a thicket by his horns (Genesis 22:13), which is similar of Christ being crowned with thorns before he was led off to be crucified (Matthew 27:29). See James L. Kugel, How to Read the Bible: A Guide to Scripture, Then and Now (New York, NY: Free Press, 2007), 126–128. Melito of Sardis, fragment five, refers to this. See Pratten, “Remains of the Second and Third Centuries,” 8:759–760. See Caroll Stuhlmueller and John J. Collins, eds., The Catholic Study Bible: New American Bible (New York, NY: Oxford University Press, 1990), 364. Elder Jeffrey R. Holland, “None Were with Him,” Ensign, May 2009, 87–88, online at lds.org. 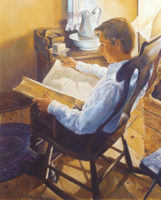 Melvin J. Ballard, Crusader for Righteousness (Salt Lake City, UT: Bookcraft, 1966), 136–137. Ballard, Crusader for Righteousness, 136–137. See Hugh Nibley, “The Sacrifice of Isaac,” Nibley on the Timely and the Timeless: Classic Essays of Hugh W. Nibley (Provo, UT: Religious Studies Center, Brigham Young University, 2004), 149. Ballard, Crusader for Righteousness, 137. Ballard, Crusader for Righteousness, 137–138. Ballard, Crusader for Righteousness, 138. Flavius Josephus was a Jewish historian who lived just after Christ. According to him, Isaac was 25 years old at this time. Abraham could not have sacrificed him without his own consent. Just as Abraham showed his faith by his willingness to sacrifice his son, Isaac also showed his faith by his willingness to allow himself to be sacrificed. Abraham was a similitude of the Father and Isaac was a similitude of the Son.